Free from sugar, gluten, yeast, wheat, soya, dairy, artificial colours, preservatives & flavourings. Maintains joint mobility, suppleness and elasticity of tendons, ligaments and connective tissue. Ideal for those who are very active and those who want to maintain joint health. For adults and children over 12 years of age. Take one tablets daily, preferably in the evening. Do not exceed recommended dose unless advised by a suitably qualified person. 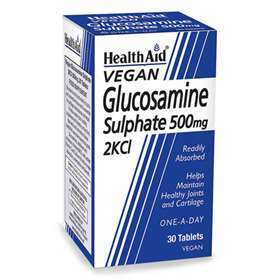 Diabetics should consult a doctor before taking Health Aid Glucosamine Sulphate. Do not take this product if you are allergic to shell fish. Glucosamine Sulphate 2KCl, Vitamin C (ascorbic acid), Calcium (calcium carbonate), Binding Agent cellulose, maltodextrin, polyvinylpyrrolidone (PVP), Glazing Agent propyl methyl cellulose (HPMC), pharmaceutical glaze, triacetin, mineral oil, Anti-caking Agent (veg. stearic acid, magnesium silicate, veg. magnesium stearate), Natural Colour (titanium dioxide), Bulking Agent (acacia).